Hear our Consent, Amplified panel discussion, recorded live on November 15 at Arts + Literature Laboratory. The panel, from left to right: Emily Mills, Martha White, Lili Luxe, Sarah Akawa, and Dana Pellebon. It was a night when it felt like a lot of pent-up frustrations were finally being aired. 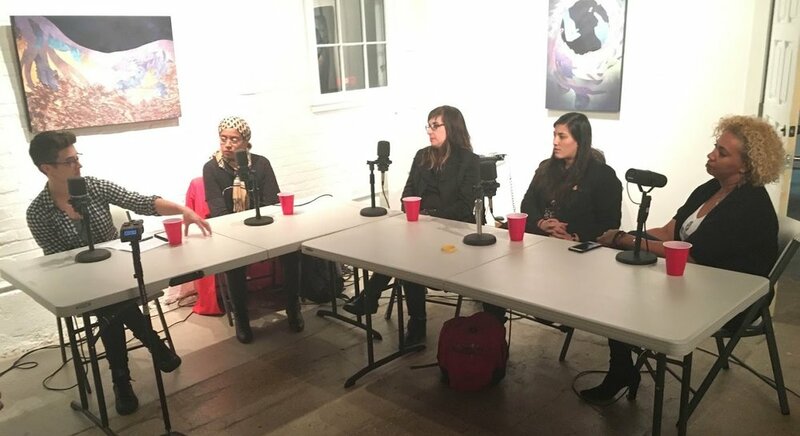 The Consent, Amplified panel discussion we hosted on November 15 at Arts + Literature Lab was hardly the first conversation people have had about making Madison's music community a better place for women and other marginalized people. However, moderator Emily Mills invited four guests—Martha White of the Cardinal Bar, independent promoters Lili Luxe and Sarah Akawa, and Frequency co-owner Dana Pellebon—who brought a diverse array of insights into the problems they face as women, members of the LGBT community, and/or people of color. And each had a lot to say about what they're doing to make things better, from hosting safe-space dance nights to subtly intervening in bad situations. We recorded the evening, and on this week's podcast you can hear the entire discussion minus a concluding Q&A session. It's a long recording so I'll keep the intro brief. However, I should note that our survey about these issues is still open, and we're also going to continue this effort in the stories of other stories and events. If you've got ideas or feedback about any of this, we'd love to hear from you—you can email me here and email Emily here. Don't forget to subscribe to our podcast on iTunes and catch WORT-FM's weeknight local news show, which partners with us to produce these.